Just to be different, we will make a small enhancement and do away with the Potentiometer that is normally required to adjust the screen contrast. Instead we will use one of the Arduino PWM outputs, smoothed by a capacitor, to create a simple Digital to Analog output which will allow us to control the screen contrast digitally from within our program. Pin 9 is used as the PWM output and this connects to the Vo contrast pin on the LCD (pin 3). A 100uF capacitor is connected between the PWM output and ground. The contrast pin on the LCD requires a fairly small voltage for ideal display conditions. The lower the voltage the higher the contrast and vice versa. A voltage of approx 0.5V to 1V is about right, but depends on the ambient temperature. We have set the PWM output initially to 50 (output is ON about 20% of the time) to give a value approximating 1V. You may want to increase or decrease this figure to get the correct contrast on your LCD screen. 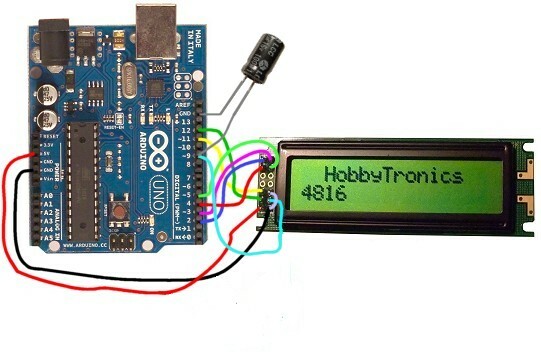 And here is the Arduino Sketch. The PWM output to control the contrast is done in the setup routine, however, if you wanted to be able to control the contrast manually, then the addition of two push buttons and a bit more coding would allow you to increase and decrease the contrast in simple steps within the program. can usually tell them by the 16-pin interface. Note on 16x4 displays. 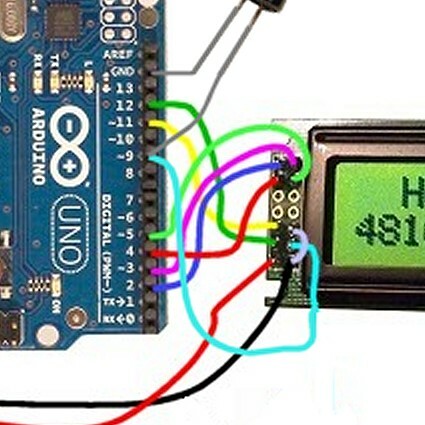 There is a well documented bug in the Arduino LCD library with regard to all 16x4 displays. The problem is that the 16x4 has different starting addresses for lines 3 and 4 than the 20x4 for which the library is written.This means that the lcd.setCursor command doesn't work correctly for lines 3 and 4. There is fortunately a simple fix. Instead of lcd.setCursor(0,3) to set position at the beginning of line 3 you should use lcd.setCursor(-4,3). The same applies to line 4.